More than a decade ago, the Kansas City Area Transportation Authority launched an express bus system along Main Street between the Country Club Plaza and the City Market. Known as the Metro Area Express, or MAX, that 6-mile route proved so successful that five years later, in 2010, the authority added another line along Troost Avenue. A third route, along Prospect Avenue, is scheduled to start running in a few years. MAX has gradually expanded in response to consumer demand. The new Kansas City streetcar launched in May amidst a weekend celebration with Kansas City Mayor Sly James leading the opening ceremonies. Think of MAX as that dedicated employee who grinds it out day after day and gradually rises through the ranks. The streetcar? It’s the well-connected blue blood who catapults to the top. MAX transported nearly 3 million riders last year combined on two routes totaling about 19 miles. Startup cost: $51.6 million. This comparison, at least, indicates you get more bang for your buck by investing in the meat-and-potatoes type of transit that people use to get to work and elsewhere. So, what if the city and its regional partners had expended as much time and energy on financing roughly $100 million in upgrades to the existing seven-county transit system? 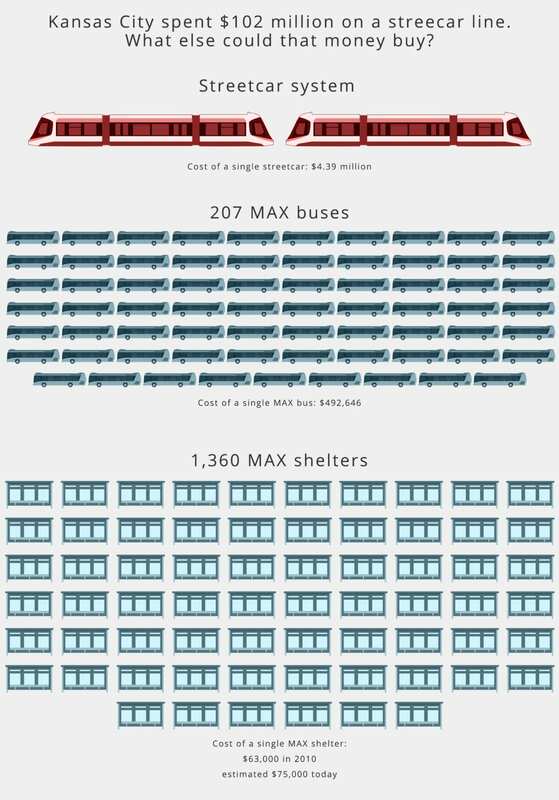 Could the ATA add buses? Extend routes? Improve shelters? Transit advocates acknowledged the current system needs upgrades. But, they argued, comparing spending between the two modes is not necessarily apples to apples, a sentiment not shared by other interested observers. Kite Singleton, for one, has come around to the thinking that the streetcar is more effective at attracting new development than bus systems. He is the former chair of the Kansas City Regional Transit Alliance and a longtime advocate of bus rapid transit systems, or BRT, like MAX. Also, KCATA Board Chair Steve Klika said you have to consider that a streetcar can last twice as long as the 12-year average of a MAX bus. He also argued that the streetcar is a much better value than building and rebuilding freeways, noting as well the economic development surge prompted by the streetcar. As the CEO of the Greater Kansas City Chamber of Commerce, Joe Reardon is also a streetcar proponent. Yet, as the former head of the KCATA, he also knows the current bus system does not adequately meet a core objective of getting people to and from work. 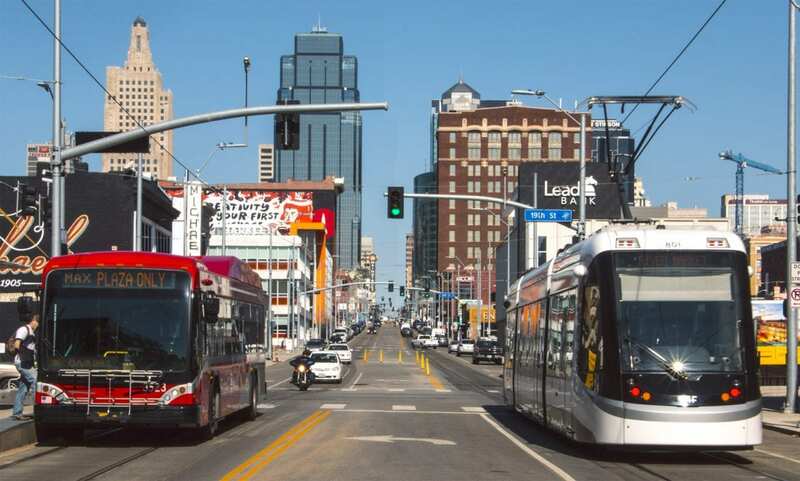 Community leaders like Vernon Howard Jr., president of the Southern Christian Leadership Conference of Greater Kansas City, do not share others’ reticence about comparing streetcar spending to the needs of the rest of the public transit system. That aggravation from within the urban core is part of why Howard spearheaded a one-eighth-cent sales tax measure for the East Side, which is on the the April 4 ballot. The sales tax would go toward revitalizing rundown areas and spurring economic development. Howard said that with investment in the area, the need for public transit will be even greater. Margaret May, executive director of the Ivanhoe Neighborhood Council, was more bullish on the benefits of the streetcar. Yet she said in her neighborhood — which is bordered by The Paseo, Prospect Avenue, 31st Street and Emanuel Cleaver II Boulevard — public transit is critical because nearly 35 percent of the residents don’t own a vehicle and earn an average $20,000 a year. May said she thinks it’s a “tragedy” there aren’t more forms of rapid transit widely available. Two years ago, the KCATA launched a workforce development project. The final results won’t be in for a few months, but Klika said the initial findings show that only 12 to 18 percent of workers in the metro area have access to public transit. The ATA is working on accommodating more riders, a process made smoother by the fact that Johnson County rejoined the KCATA in 2014. Efficiency, Klika said, means being creative in the types of vehicles it puts on the road and eliminating underperforming routes. While he was head of the transportation authority, Reardon oversaw the launch of the pilot program Bridj. Bridj is a micro-transit service that serves Hospital Hill, Crown Center, portions of Midtown and downtown, the University of Kansas Medical Center, and the 18th and Vine Jazz District. It is similar to ride-sharing services like Uber or Lyft, but the app creates a “pop-up” shuttle station, where a multipassenger van will pick passengers up. Reardon said this is part of building an innovative public transit system. — Kelly Cordingley is the digital coordinator at KCPT. Contact her at kcordingley@kcpt.org.